He is meticulous in his work, along with Vasanthi mam / Maduravalli Mam, organises a successful library program at the Deepam West Mambalam centre. He visits the centres even during weekdays to run the library program. 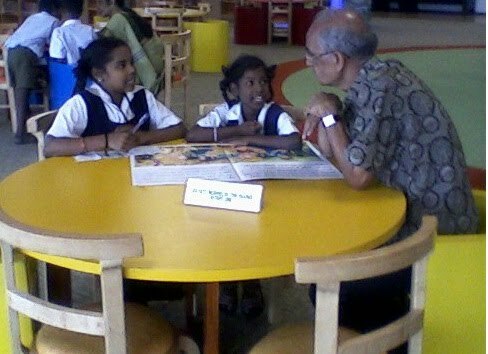 His enthusiasm to help children read was evident in the way he helped organise the Deepam WM centre trip to the Anna Library. He also prepares ‘interesting lesson plans like this 😉 . He connects with the children with ease. They adore RR sir 🙂 – no wonder he was called in as a ‘chief guest’ for the West Mambalam school’s annual day. Meera – One of the earliest volunteers, Meera was active at Deepam, despite a 2 year study break in the US. She actively evangelised Deepam in the US and brought in valuable donation dollars. When she got back, she was keen to make a difference on the ground. This keeness as evident when she encouraged the children to participate in the Google Doodle contest – I was pushed into taking her to the Uroor Kuppam on a sunday afternoon, where we met the children with the painting kits. She showed equal enthusiasm in building a strong team at the Uroor Kuppam Centre, who have been doing some great work at the centre. She also pushed us / kept hope / helped in writing an effective proposal that helped Deepam win the 2HP EdTech award.